Another visionary who pioneered the next major development in undersea exploration was a man named Auguste Piccard. A brilliant inventor who was always looking for the next opportunity, he seized upon the scientific community’s fascination with exploring the deep sea in person and built the modern precursor to the manned submersible, the Trieste. Named after the Italian city that bankrolled the huge development costs for building the craft, it was much larger and sturdier than Beebe’s bathysphere. The crew cabin was larger and roomier than the bathysphere and it had much thicker walls, making it able to withstand the higher pressures of deeper dives. It had the significant advancement of being controllable by the occupant/pilot so that it did not need to be tethered to a surface ship. 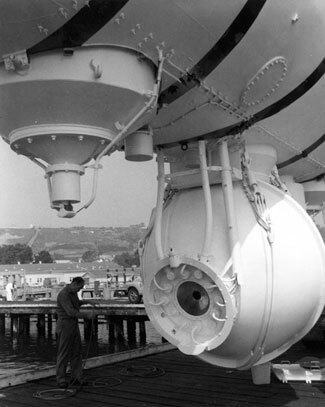 Piccard had developed an ingenious method for allowing a pilot to control the buoyancy of the Trieste, alternately using a huge, 50-foot long tank filled with gasoline (which is lighter than seawater) and lead pellets as a counterweight or ballast, which could be released in controlled amounts allowing the Trieste to rise. This early version of the Trieste did not get the financial backing and support it needed to mount continuing exploratory dives, so it was abandoned after a few years as unfeasible. In the wake of World War II and the increasing global tensions of the cold war, the United States’ interests in undersea exploration came to be seen as an urgent priority. It was determined that the ocean depths could be exploited for significant military advantages in the area of undersea communications via sonar (sound waves) and the gathering of intelligence on sunken enemy submarines. It was the U.S. Navy’s drive to gain the upper hand at all costs that fueled the costly construction of the Trieste’s predecessor, the Trieste II. Backed by the considerable capital of the U.S. Navy budget, the Trieste II was designed, built and outfitted for optimal use as military craft that just so happened to be capable of diving to extreme depths. In fact, it was the Trieste II that set the world record for the deepest manned dive in the ocean when it touched bottom in the Marianas Trench, in over 35,000 feet of water in 1951. 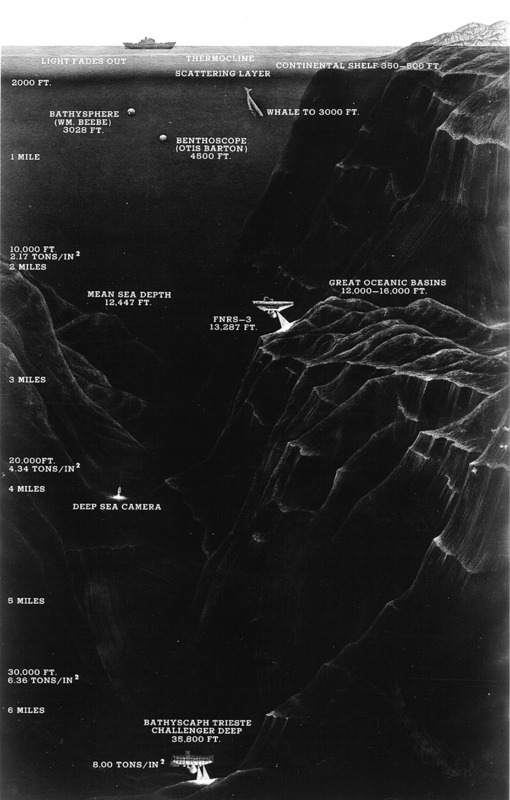 A historical map diagram showing the Trieste in the Challenger Deep. Jacques Piccard, the son of Auguste, and a Navy submariner, Don Walsh, took that record dive in 1951. It took over four hours to drop to the very bottom of the sea in the Challenger Deep. Can you imagine the fear and tension the two men must have felt as they descended silently for hours into the unblinking darkness, falling into depths no human being alive had been to? How they must have wondered if, and when, the hull of the Trieste II would begin to cave and buckle from the extreme pressure, or if it would implode suddenly and violently without warning? Even at that incredible depth, with unimaginable pressure of 16,000 pounds per square inch and utter blackness, Piccard and Walsh observed living organisms, swimming effortlessly about. Unfortunately, they had no camera with them on that dive, and one of the external lights imploded from the extreme pressures of the deep so that could not have successfully photographed what they saw anyway. Skeptics later criticized Piccard’s observations, claiming that they must have been hallucinating at such a depth, for it seemed impossible that anything could be found living in such inhospitable conditions. So costly and risky was this manned descent into the Challenger Deep that no one has done it since.